Home Coming shared the modern bedroom makeover they did on their son's room. Awesome. 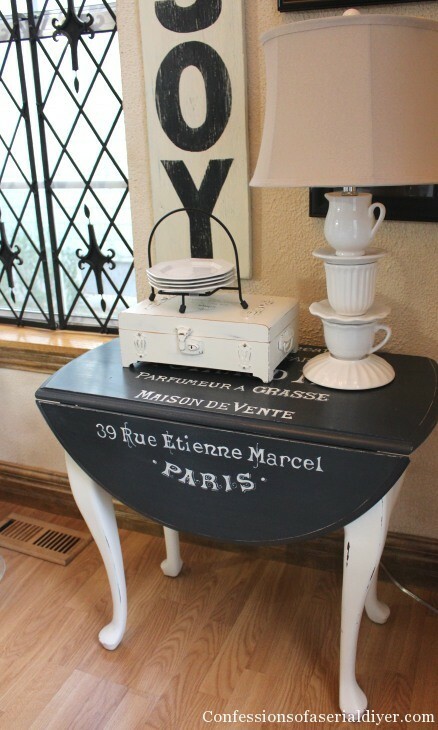 Confessions of a Serial Diyer shared a great tutorial on how she transformed this drop leaf table. I love the graphics and she gives a step by step on how she did the transfer. Neverending Decorating shared a tutorial on how she created this super cute winter pine cone wreath. An Extraordinary Day shared a recipe for snow ice cream. Perfect timing for me as I sit here with a blizzard outside! Will definitely try this recipe. Judy...I am thrilled to have my Snow Ice Cream featured on the blog tonight. What a delightful surprise as I was "flying in" for the party! Wow! The features are fabulous. I'm feeling so blessed to be among such extraordinary talent. Hope your week is filled with extraordinary moments. Thanks so much for hosting, Judy! I hope you have a great week! Judy, thank you so much for featuring my winter wreath and for always hosting this party. Have a great week. Thanks for hosting Winter Blues Wednesday. My boys would love that bedroom! Thanks for hosting! Thanks so much for the feature! We're honored. Judy, thank you for hosting this wonderful party every week! !